Special Legislative Concerns: spending, tax and regulatory policy, and education. He lived in Little Falls, Minnesota before he moved to East Grand Forks, Minnesota, with his family. He was a member of Trinity Evangelical Free in Lakeville, Minnesota. 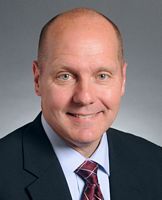 He declared his candidacy for Minnesota Governor, with Representative Michelle Benson as his running mate, in 2013. They later withdrew. Leadership Notes: He resigned from this position on July 3, 2013.